Install horizontal furring strips, or a solid nailable sheathing prior to the siding, if needed, to level the surface or provide sufficient material for fastener penetration. If furring strips are used, install them 12” (305mm) on center or as specified in the siding manufacturer’s installation instructions. Be sure to use furring or sheathing material with the thickness specified in the manufacturer’s instructions. If the instructions specify the use of special nails (e.g., ring shank nails), be sure to use them and follow the instructions for nail spacing. Snap a level chalkline around the base of the sidewalls. Typically, the chalkline is positioned so that the bottom of the J-channel that will be installed like a starter strip is 1/4” (6.4mm) below the lowest point on the wall that will be sided. (See the Accessories section for tips on snapping a chalkline.) Install J-channel along the chalkline as a receiver for the vertical siding. As with horizontal siding, when installing vertical siding, it is necessary to install several accessories first, including corner posts and window, door, and roof trim. NOTE: Install vinyl soffit and fascia before installing outside and inside corner posts. Leave a 1/4” (6.4mm) gap at the top of corner posts. Place the first nails in the uppermost end of the top nail slots to hold them in position (Fig. 52). Place all other nails in the center of the slots. Nails should be 8” to 12” (203mm to 305mm) apart. Corner posts should extend 1/4” (6.4mm) below the siding. Do not nail tightly; the corner post should move. With insulated siding, use the manufacturer’s approved corner post to receive the additional thickness of the insulation. If one is not available, shim the post with foam or other shim material. Always consult the manufacturer’s instructions first. Position the top edge of a J-channel or vertical base along the previously snapped chalkline. Remember to drill minimum 3/16” (4.8mm) diameter weep holes no more than 24” (610mm) apart (Fig. 53). Fasten every 8” to 12” (203mm to 305mm). Use the center of the nail slots. All vinyl should be fastened securely but not tightly. Sideways movement should not be restricted. Leave 1/4” (6.4mm) gaps at the corner posts (Fig. 53). Where lengths adjoin, trim the nailing flange 1” (25.4mm) and overlap 3/4” (19mm) to produce a neat joint (Fig. 54). Install J-channel at the tops of the sidewalls (Fig. 55). At the gable ends, snap a level chalkline along the base of the gable and install J-channel. Overlap where necessary and allow for expansion (Fig. 54). Cut a J-channel for the bottom of the window, the width of the frame plus the width of the side J-channels, and install it. Cut the side J-channels the length of the frame plus the width of the top and bottom J-channel. Cut notches in the top of the side J-channel. Cut and bend tabs (Fig. 56) into the bottom channel. Install the side channels. Cut the top J-channel the width of the frame plus the width of the side J-channels. Notch the top J-channel on each end, bend the tabs into the side J-channel, and fasten the top J-channel (Fig. 56). A miter cut and tab can be provided at the bottom of the window (Fig. 57), depending on the sill’s condition. To create a balanced appearance (Fig. 58), divide the length of the wall by the exposure of the vertical panel to be used. For example, if the wall requires 20 full panels plus an additional 8” (203mm), then the first and last pieces installed would be cut to a new width of 4” (102mm). Make sure to allow for proper depth in the receiving channels of the accessories at both ends when measuring. To install the siding, if partial panels are required, mark the line to cut by measuring from the edge of the lock of the panel and cut the panel to the proper width. This will leave a panel with an intact nail hem and proper exposure. If cut is on a flat area, use a snap lock punch, and install into utility trim. The utility trim will need to be shimmed to maintain the face of the panel (i.e., soffit panels). Shims should not be needed in most cases with board-and-batten panel. To complete this starting piece, snap the tabs into the utility trim, plumb the panel level, and begin securing by placing a fastener at the top of the topmost full nail slot, allowing for 1/4” (6.4mm) upward movement and 3/8” (9.5mm) downward. (Some manufacturers’ vertical siding instructions are different; consult with the manufacturer for specific installation instructions). Continue securing with fasteners centered in the nail slots not more than 12” (305mm) apart. Install successive panels by securing from the top-most full nail slot downward, as described above, then 12” (305mm) on center for the rest of the panel. Around windows, doors, and fixtures, allow 1/4” (6.4mm) clearance in receiving channels (increase to 3/8” [9.5mm] if installing below 40° F [4.4° C]). When the panels are cut in the “V” groove or on the flat surface of the panel to accommodate an opening, install utility trim to properly secure panels, as described above (Fig. 59). Check the plumb of the installation every few panels to maintain the best appearance. If it will take more than one course to span the height of the house, terminate the first course into an inverted J-channel (Fig. 60), allowing 1/4” (6.4mm) for expansion. Install head flashing on top of the J-channel and install a second J-channel facing upward. Begin the second course leaving a 3/8” (9.5mm) gap from the bottom of the panel to the J-channel. NOTE: It is necessary to drill weep holes in the upper J-channel that are a minimum 3/16” (4.8mm) in diameter no more than 24” (610mm) apart. The final siding panel should be the same width as the starting course. Depending on where the cut occurs, it may be necessary to install utility trim inside the receiving pocket of the J-channel or corner post that receives the vertical siding (Fig. 59). It may also be necessary to shim the utility trim outward to a level equal that of the siding panel face, in order to keep a level appearance. Cut the panel to the proper width and create tabs every 6” (152mm) using a snap lock punch. Finish the installation by inserting the tabs of the properly sized panel into the utility trim. It may be necessary to place a color-matched trim nail near the top of the panel and inside the J- channel or corner post to keep the partial panel from dropping. If you are starting with a full vertical siding panel, you can create a starter strip for vertical siding by cutting the nail hem and adjacent lock off a vertical siding panel. Fasten it inside the receiver channel of the corner post. Be sure this piece is plumb. Leave enough clearance in the pocket of the corner post to allow the siding panel to be attached (Fig. 61). For application of vertical siding to gables, use the same method described in Fig. 58 for a balanced appearance. Begin by fastening J-channel along the inside edge of the roof. Install an upward-facing J-channel as a vertical base on top of the previously installed J-channel at the base of the gable, as shown in Fig. 60. As an alternative, install back-to-back J-channels, centered with the peak of the gable. Install a cut nailing hem as a starter-strip in each J-channel, as described above (Fig. 61). Make a pattern for end cuts along the gable using two pieces of scrap siding (Fig. 62). Lock one piece into the vertical strip at the center of the wall. Hold the edge of the other piece against and in line with the roof line. Mark the slope on the vertical piece and cut along that line. Use it as a pattern to mark and cut the ends of all other panels required for this side of the gable end. Make another pattern for the other side of the gable. Walkable neighborhoods are on the rise. That means more developers are focusing on building planned communities over traditional single-family subdivisions. 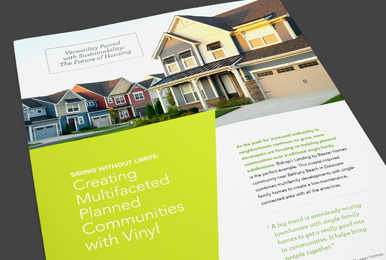 The Case for Vinyl Siding’s Eco-Friendly Benefits Gets Stronger.